Walmart continues to pull out all the stops in its drive to expand online grocery delivery. The Bentonville, Ark.-based retail giant said Thursday that it has partnered with last-mile delivery providers Point Pickup, Skipcart, AxleHire and Roadie to help power the Walmart Grocery Delivery service in metropolitan areas across four states. That coverage area is slated to be expanded in the coming weeks, according to Walmart. Overall, the retailer currently offers online grocery delivery in more than 100 metro areas, with plans to make the service available in over 300 metro markets by the end of 2019. Currently, more than 800 Walmart stores offer grocery delivery. The company aims to double that number this year. Walmart has actively pursued third-party partners in ramping up e-grocery delivery. The company works with outside service providers like Postmates, Doordash and Deliv for grocery delivery from Walmart U.S. stores, while its Sam’s Club and Walmart Canada subsidiaries use Instacart for online grocery service. Earlier this year, Walmart ended delivery partnerships with Uber and Lyft and abandoned a test in which Walmart employees delivered groceries to customers after their regular shifts. Point Pickup bills itself as a delivery provider not just for the last mile but also for the “middle mile,” or deliveries to a location before the customer’s home. An on-demand platform, Skipcart specializes in last-mile solutions for retailers offering pickup service but lacking same-day delivery, while AxleHire touts on-time accuracy and reliability, including photo proof of delivery. Meanwhile, Roadie describes its service as “on-the-way” delivery. The collaborative model leverages extra space in passenger vehicles by connecting parties looking to send items with drivers heading in the right direction. Similarly, Walmart this summer began testing a crowdsourcing-based service called Spark Delivery, which uses delivery logistics platform Bringg to engage with independent drivers to pick up grocery orders at Walmart stores and deliver them to customers. Walmart, too, is engaged in several pilots using self-driving vehicles to fulfill online grocery orders, with partners including Udelv, Ford and Waymo. In the test with Waymo (formerly Google’s self-driving car project), being conducted in Chandler, Ariz., autonomous vehicles pick up customers at their homes and take them to the store to collect their orders. 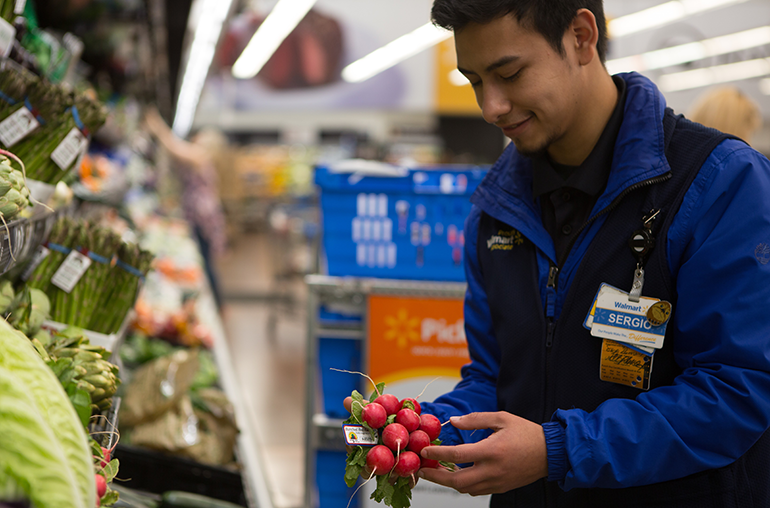 Through Walmart Grocery Delivery — accessed via Walmart.com/grocery or the Walmart Grocery App — consumers can buy fresh produce, meat, seafood, bakery items, pantry staples, various consumables and seasonal general merchandise. At checkout, they select a delivery time window. After orders have been picked by Walmart personal shoppers, a member of the delivery partner’s team retrieves the order from a Walmart store and delivers it to the customer in the designated time frame. Orders carry a $30 minimum and a simple fee structure with “no subscription, no price markups,” Walmart said. In addition, Walmart offers an Online Grocery Pickup service that allows customers to order their groceries online and collect them at stores without leaving their cars. The company plans to have 2,140 online grocery pickup sites, covering 69% of U.S. households, and online grocery delivery through over 800 stores, covering about 40% of the population, by the close of its 2019 fiscal year at the end of January. For fiscal 2020, Walmart is targeting about 3,100 curbside pickup and 1,600 delivery locations. Last week, Walmart launched a major promotional campaign led by eye-catching, action-packed TV commercials highlighting the speed and ease of Walmart Grocery Pickup service.